Greyfriars Tower01553 763044work Historic SiteOf the 60 Franciscan friaries that existed in England prior to the suppression in 1538, significant remains of only 16 exist. 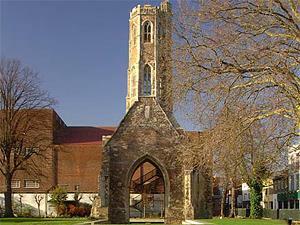 Greyfriars Tower is one of only 3 remaining in the country, and is the most attractive and complete. The tower is a key landmark in King's Lynn and it owes its survival to this as, for centuries, it proved useful as a seamark for traders and sailors navigating the difficult waters of The Wash.
Grade I listed/Scheduled Ancient Monument status, the tower is located in the attractive Tower Gardens on land formerly within the boundary of the friary. The gardens were laid out in 1911 to mark the coronation of King George V. They also contain the Public Library completed in 1905, and the King's Lynn War Memorial, designed in 1921. The Tower gardens have been remodeled utilising hard landscaping to indicate the location and extent of the nave, north aisle, chancel, cloister walks and chapter house enhancing interpretation and awareness of the complex. With the benefit of Heritage Lottery Fund and English Heritage funding restoration and enhancement of the leaning tower and gardens was completed in 2006.
" Civic Pride and Monuments Green Apple Silver Award presented by the Green Organisation in 2007.
" The RIBA East Spirit of Ingenuity Heritage Award 2007.
" The RIBA East Spirit of Ingenuity Public Sector Award 2007.
" Campaign to Protect Rural England Norfolk Environmental and Architectural Award. Of the 60 Franciscan friaries that existed in England prior to the suppression in 1538, significant remains of only 16 exist. Greyfriars Tower is one of only 3 remaining in the country, and is the most attractive and complete. The tower is a key landmark in King's Lynn and it owes its survival to this as, for centuries, it proved useful as a seamark for traders and sailors navigating the difficult waters of The Wash.
Greyfriars Tower was a finalist in the first series of the BBC2 programme Restoration. The tower and gardens is open to the public.